Winter is going to be on its way out soon and it just might be time for a new bike! The options out there are plentiful, and the process can be a bit overwhelming. On top of the various manufacturers, models, and components to choose from, when do you look for women’s specific models? Bike manufacturers are taking a much greater interest in the fact that women are, in general, built with different proportions than men, therefore bikes should be sized differently. There are still more options for non-women’s specific bike models, but it’s come a long way over the last decade. 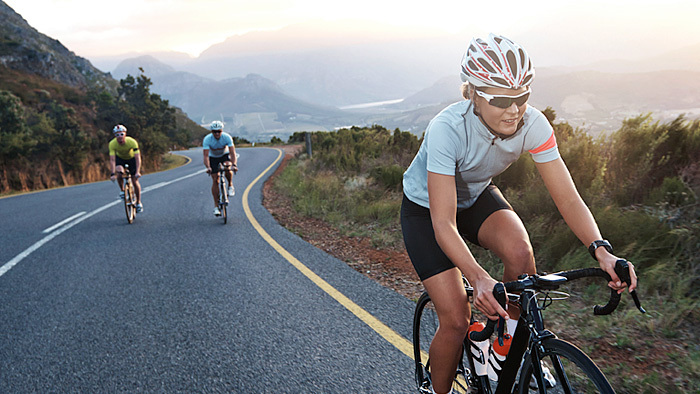 Whether you are looking for a road, mountain, or time trial bike, women have a lot more options these days. The most important thing when choosing a new bike is fit. It is your body’s contact points to the bike that determine how comfortable that bike is. Contact points are your rear on the saddle, your feet on the pedals, and your hands on the handle bars. If any of those things isn’t set up right, then chances are you won’t be happy on your bike. And we want you to be happy! If we start with our rear on the saddle as the primary contact point, we need to make sure that our hands comfortably reach the handlebars (I’ll talk about saddles specifically later.) Women’s specific designs have shorter top-tubes to account for the shorter torsos that women have relative to men. Women may also have narrower shoulder widths, and since we want our bars to be the proper width, so women’s designs come with narrower handlebars. Our hands are usually smaller so for better comfort and handling, more narrow grips or a shorter reach from hoods and drops to the brakes can be not only nice, but a safety feature as well. Next let’s consider the fit from our seat to the pedals. The seat tube angle is often a bit steeper on women’s specific bikes, as relative to men our legs are longer in proportion to our torso. If our legs are not set up properly, then we’re definitely not going to be able to turn the pedals as efficiently or with as much power as we are capable. If you know you have a short torso, a women’s specific bike will likely be more comfortable. If you are taller than about 5’8” or have a longer than typical torso, a non-women’s specific bike might suit you better. There may be some men out there that are better suited for a women’s specific bike due to their proportions. We know if our rears ain’t happy, ain’t nobody happy. Saddle comfort can make or break a ride, and our parts are different from guy parts. But everyone is different, so just as any cyclist needs to do, you just need to try different saddles. You might find a women’s specific saddle more comfortable than a unisex or men’s saddle, or you might not. It doesn’t matter what saddle you buy, only that it fits your parts. While the color of your bike unfortunately doesn’t determine how fast it goes ( I have a special affinity for red), women’s specific design color schemes can sometimes be more “girly” than desired for some. I believe bike manufacturers are listening and realize we all don’t necessarily want to be pretty in pink. Buying a bike is all about fit, so try different brands as well as women’s specific and non-women’s specific. A good bike shop will help you make sure that those important contact points are in the right place for your body so you get the right bike for you.